Some 170 local elementary school students took part in this year’s My Day at McGill event. For the past seven years, the Community Engagement branch of the Social Equity and Diversity Education (SEDE) Office, in collaboration with participating school boards across Montreal, has hosted My Day at McGill: two days of activities and workshops for elementary school youth on campus. 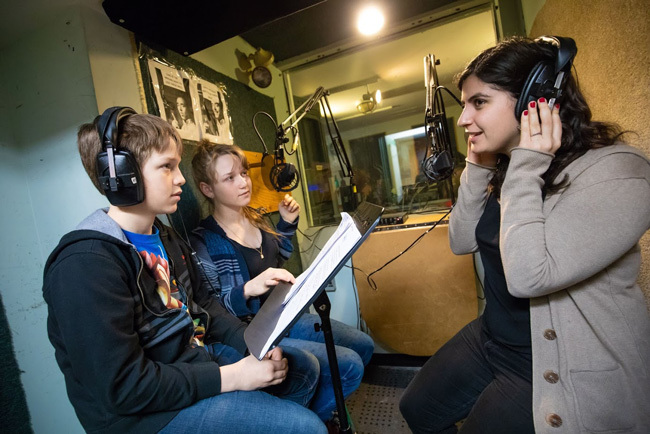 This initiative encourages access to education and acts as a bridge between McGill and the larger Montreal community, showing over 170 youth some of the opportunities their education could lead to. Activities this year were hosted by students from Chemistry, Physics, Medicine, Nursing & Engineering. Staff from the McLennan Library also hosted an engaging tour and PhD (Social Work) student Ben Geboe represented First Peoples’ House with activities introducing youth to Indigenous culture and history. Lunch was held at the School of Architecture & Urban Planning and healthy snacks were once again donated by McGill Student Housing and Hospitality. The beauty of the project lies in its capacity to introduce youth to the importance of science and to make science learning accessible, as well as affording scientists themselves the rare opportunity to do community outreach and to hone their science communication skills. According to founder Rackeb Tesfaye, currently a McGill PhD candidate in Neuroscience, many students have mentioned one reason they don’t participate in outreach an science communication is not due to a lack of interest, but rather time away from their lab, which their supervisors might disapprove of. She emphasizes the need to promote more transparency and visibility of science in the public sphere, integrating this into upper level science students’ education and responsibilities. This ethos of exchange, combined with a desire to diversify the voices that are represented in science communication, led to the birth of Broad Science, as a means of offering a venue for marginalized voices to “tell their own stories,” and in turn, to demonstrate to kids that scientists come from all different backgrounds and genders. Edwin Wong, who is a Master’s student in IPN researching Alzheimer’s, was interviewed by a nine-year-old My Day at McGill student, and says this experience in communication is “like a different language…we should train scientists to be fluent in that accessible language.” Alexia Ostrolenk, a PhD candidate researching Autism at U de M, pointed out that she didn’t meet many scientists growing up, especially young women of colour, so it is important for her that young kids see what a scientist can look like. Much like My Day @ McGill, Broad Science is rooted in the value of supporting more outreach between universities and the public. As the five scientists who were interviewed that morning explained, this initiative is not only an important learning opportunity for kids to engage with radio production and science communication, but is a learning opportunity for researchers themselves to engage a different kind of audience than those they interact with in the lab. In so doing, Broad Science is both diversifying the kinds of scientists that are represented in media as experts in their fields, highlighting women and people of colour, as well as diversifying the audience that is receiving and using those stories in their lives. This kind of equitable work is a compliment and a commemoration of McGill’s reputation for excellent research and scientific learning, and can inspire the next generation of scientific inquiry by passing them the mic. Sydney has worked at the SEDE Office doing Communications since September 2017. They completed a Master of Anthropology in Budapest, and do research in the field of queer community building, using both creative and academic writing in order to connect with others.